This is a short EL13 encounter for four to six player characters (PCs) of 10th-12th level. The encounter takes place on a road cut through a heavily wooded area. It may take place in any type of area or climate. 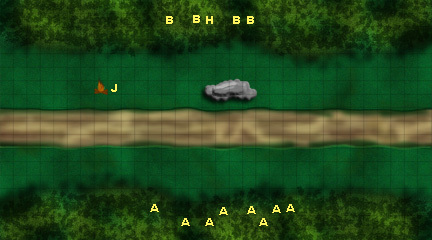 While a map is provided, the DM is encouraged to add his or her own flair to the encounter, perhaps by adding rough terrain to the map or by altering the positions of some of the antagonists. The orc archers and berserkers in this encounter are not carrying any treasure except for their gear. If the PCs survive the encounter and wish to rid the area of orcs completely, they can track fleeing survivors or pick up the orcs’ arriving trail to a war camp four miles into the forest. The DM is encouraged to populate this camp as he or she sees fit, but may want to add an additional 2d4x100gp worth of looted treasure to the area to make up for the lack of treasure carried by the orc archers and berserkers. The orcs have chosen a very good spot to plan an ambush and have gotten quite adept at decimating their targets here. The orc berserkers are prone and have been covered up by dead leaves and the orc archers and Houge Krahl are hidden in a low ditch behind a series of shrubs and bushes. Both groups have been inspected by Jarell Khairn to ensure they’re well-hidden, and a DC 22 Spot check is required to notice either group. Jarell Khairn is not hidden at all. He is located in the open just off the road near a campfire, seemingly in meditation. Tactics: As soon as the PCs stop to talk to or attack Jarell, the archers let loose with a volley of arrows. This is Jarell’s signal to yell in fear and bolt for the supposed safety of a nearby rock formation. One round later, the berserkers break cover and charge the PCs, acting like a hammer to the rock’s anvil. Houge Krahl also charges in and Jarell keeps up his act until either Houge or the berserkers arrive, when he turns on the PCs as well. The berserkers use their rage ability as soon as they’re able to attack the PCs and they use their Power Attack feat for maximum damage. The archers target any PCs they can see or, if the PCs are hidden by the rocks, prepare actions to attack any PC that shows himself. After three rounds of combat, the archers move in to help their comrades, switching to their battleaxes, if necessary. Scaling the Encounter: To scale the encounter back to EL12, reduce the number of archers by four and the number of berserkers by one. Swap out the berserkers’ Power Attack feat for Toughness. To scale the encounter up to EL14, add two more archers and four more berserkers and swap out the new berserkers’ greataxes for longspears. Reading the Map: The letters marked in yellow represent ambushers. Squares marked with an A contain archers and squares marked with a B contain berserkers. The square marked with an H is where Houge Krahl is hiding and the square marked with a J is where Jarell Khairn waits for marks to pass by. One square west of Jarell is a campfire. Anyone that passes through or is pushed into this square takes 1d2 fire damage. The road and open grassy area are easy terrain and may be passed through as per normal. The forested area counts as difficult terrain and anyone located more than two squares into the forest has cover against opponents outside the forest. Likewise, anyone outside the forest has cover against anyone attacking from more than two squares into the forest. The rock formation is about 10 feet tall and has been weathered smooth by years of rain, though it contains a few fissures that could be used as hand and foot holds. The rock may be scaled with a DC 20 Climb check. Male half-orc cleric 8/barbarian 4: CR 12; Medium humanoid (human, orc); Hit Dice 8d8+4d12+36; 103 hp; Init +1; Spd 30 ft. (6 squares); AC 21 (+1 Dex, +6 armor, +3 shield, +1 deflection), 12 touch, 17 flat-footed; BAB/Grapple +10/+13; Atk +15 melee (1d8+3/19-20x3, +1 keen spear) or +12 ranged (1d8+3/19-20x3, +1 keen spear); Full atk +15 melee (1d8+3/19-20x3, +1 keen spear) and +10 melee (1d8+3/19-20x3, +1 keen spear) or +12 ranged (1d8+3/19-20x3, +1 keen spear); SA rage (2/day), rebuke undead, spells; SQ darkvision 60ft, fast movement, uncanny dodge, orc heritage, trap sense +1; AL CE; SV Fort +14, Reflex +5, Will +10; Str 17, Dex 13, Con 16, Int 8, Wis 15, Cha 6. Skills and Feats (armor check –4): Climb +4 (1 barbarian, +3 Str), Concentration +7 (4 cleric, +3 Con), Hide +6 (+1 Dex, +5 item), Intimidate +5 (7 barbarian, -2 Cha), Jump +4 (1 barbarian, +3 Str), Knowledge (religion) +3 (4 cleric, -1 Int), Listen +7 (5 barbarian, +2 Wis), Move Silently +6 (+1 Dex, +5 item), Spot +7 (+2 Wis, +5 item), Survival +9 (7 barbarian, +2 Wis); Greater Overrun, Improved Overrun, Power Attack, Scorpion’s Strike, Superior Overrun, Weapon Focus (spear). Strength Domain: Once per day as a supernatural ability, Houge Krahl can perform a feat of amazing strength. He gains an enhancement bonus to Strength equal to his cleric level (8), which lasts for a single round. Activating this power is a free action. War Domain: Houge Krahl gains the Weapon Focus (spear) feat. Typical Cleric Spells Prepared (6/6/5/4/3; Save DC 12+spell level): 0th—cure minor wounds, guidance (x2), resistance, virtue (x2); 1st—bane, cause fear, command, deathwatch, doom, enlarge person*; 2nd—bull’s strength*, cure moderate wounds, darkness, death knell, hold person; 3rd—bestow curse, cure serious wounds, magic vestment*; 4th—divine power*, poison, spell immunity. Possessions: Amulet of health +2, +1 breastplate of shadow, boots of elvenkind, cloak of resistance +1, eyes of the eagle, +1 heavy wooden shield, holy symbol (wooden), +1 keen spear, potion of cure moderate wounds, ring of protection +1, scroll of cure serious wounds, traveler’s outfit. Eyes: Small and angry, with pupils that look solid black. Hair: Black. Short and messy, with the appearance of having been cut with a dull knife. Skin: Light gray, the color of limestone. Ruddy and scarred. Houge Krahl lives to fight. Every aspect of his daily life is geared towards fighting. He dominates those around him, cowing them into admitting that his is stronger than they are. Those he can’t intimidate thusly, he goads into challenging him, where he makes an example of them for others to see. Houge Krahl has become the warchief of a band of vicious orc warriors through little more than his own strength and brutality, which is legendary, even among orcs. Despite the stigma of being a half-orc among orcs, his ruthlessness and fearlessness in combat put him in a position to challenge the last warchief. Once he prevailed, there was no shortage of those wishing to challenge him, seeing a half-orc as an easy target. Thus far, Houge Krahl has brutally slaughtered more than a dozen such challengers. Many assassination attempts have also been made but between the strength of Houge and the diligence of his good friend Jarell, each has been thwarted. Unlike some other orcish chieftains, Houge Krahl does not like to showboat his fights, dragging them out for the entertainment of whoever might be watching. Instead, he is brutally efficient, seeking to end the fight as quickly as possible. Usually, he will open a fight by overrunning his opponent(s), stabbing them with his spear as he barrels over them. If he’s facing a single opponent, he will position himself within reach so he may attempt to stab them as they stand up. Against an opponent larger than himself or against multiple opponents, he will often use his rage ability to increase his Strength and make it more likely he will prevail with an overrun attack. Houge Krahl prepares spells that either aid him or hinder his opponents, and does not concern himself with buffing his allies. If he knows a fight is coming, he will prepare himself using bull’s strength and enlarge person. If he’s facing more than one opponent, he will also use bane. Houge Krahl has triumphed against more than one strong opponent by using hold person to paralyze them and then making a coup de gras attack with the bonus damage from his strength domain ability. Male human monk 8/ ranger 2: CR 10; Medium humanoid (human); Hit Dice 10d8+10; 50 hp; Init +6; Spd 50 ft. (10 squares); AC 18 (+2 Dex, +2 Wis, +2 armor, +2 monk), 16 touch, 16 flat-footed; BAB/Grapple +8/+13; Atk +11 melee (2d6+1, unarmed strike); Full atk +11 melee (2d6+1, unarmed strike) and +6 melee (2d6+1, unarmed strike) or +9 melee (2d6+1, unarmed strike) and +9 melee (2d6+1, unarmed strike) and +4 melee (2d6+1, unarmed strike) or +7 melee (2d6+1, unarmed strike) and +7 melee (2d6+1, unarmed strike) and +7 melee (2d6, unarmed strike) and +2 melee (2d6+1, unarmed strike); SA flurry of blows, stunning fist (9/day); SQ evasion, fast movement, ki strike (magic), purity of body, slow fall (40 ft.), still mind, wholeness of body; AL LE; SV Fort +10, Reflex +11, Will +8; Str 12, Dex 14, Con 12, Int 13, Wis 15, Cha 8. Skills and Feats: Balance +6 (4 monk, +2 Dex), Climb +5 (4 monk, +1 Str), Concentration +5 (4 monk, +1), Escape Artist +6 (4 monk, +2 Dex), Hide +9 (7 monk, +2 Dex), Jump +5 (4 monk, +1 Str), Knowledge (dungeoneering) +3 (2 ranger, +1 Int), Knowledge (nature) +3 (2 ranger, +1 Int), Listen +10 (8 monk, +2 Wis), Move Silently +9 (7 monk, +2 Dex), Search +6 (5 ranger, +1 Int), Sense Motive +7 (5 monk, +2 Wis), Spot +10 (8 monk, +2 Wis), Survival +7 (5 ranger, +2 Wis), Tumble +13 (11 monk, +2 Dex); Combat Reflexes, Improved Grapple, Improved Initiative, Improved Trip, Improved Unarmed Strike, Stunning Fist, Two-Weapon Fighting, Weapon Finesse, Weapon Focus (unarmed). Combat Style (Ex): Jarell Khairn has selected two-weapon combat. He gains the Two-Weapon Fighting feat. Favored Enemy (Ex): Jarell Khairn gains a +2 bonus on his Bluff, Listen, Sense Motive, Spot, and Survival checks when using these skills against orcs. He gets the same bonus on weapon damage rolls against orcs. Ki Strike (Su): Jarell Khairn’s unarmed attacks count as magic weapons for the purposes of overcoming damage resistance. Wild Empathy (Ex): Jarell Khairn can improve the attitude of an animal in the same way a Diplomacy check can improve the attitude of a sentient being. He rolls 1d20+1, or 1d20-3 if attempting to influence a magical beast with an Intelligence score of 1 or 2. Possessions: Bracers of armor +2, monk’s belt, monk’s outfit. Eyes: A fierce dark brown. Hair: Shaved, though it can sometimes be a week or two before he shaves again. Skin: Dark mahogany brown stretched tight over hard muscles. Jarell Khairn is a quiet, brooding man. He seems to exude an aura that warns others not to bother him, and looks perpetually irritated. This didn’t stop many of the orcs in Houge Krahl’s band from trying when he first showed up, but though they may have initially laughed at his lack of weapons, every one of them maintains a respectful distance from him whenever possible. When he initially stumbled on the orc warband, Jarell was forced to fight for their amusement. After killing several strong warriors with his bare hands, the warchief, Houge Krahl set him free, proclaiming him a great warrior. Jarell chose to stay and since then, has been like Houge Krahl’s shadow, watching his back and helping prevent his assassination. Jarell Khairn has neither the need or want of weapons. If possible, he will attempt to ambush an opponent from hiding, using his Stunning Fist feat to set the opponent up for Houge Krahl to skewer. If ambushing a target is not possible, he will instead become a whirling dervish of limbs, throwing fists and feet, knees and elbows, shoulders and even the occasional headbutt in a frenzy, trying to beat his way through his opponents before they have a chance to react. Often, the first attack he makes in a full attack action will be a Stunning Fist attempt to make it easier for the rest of his blows to land. Against more than one opponent, Jarell may use his flurry of blows to cause damage, but if he and Houge Krahl are outnumbered, he’s likely to attempt a series of trip attempts instead, using his Improved Trip feat to put his enemies on the ground where he and his companion can more easy deal with them as they lie prone and as they try to stand. If an opponent wanders too close and provokes an attack of opportunity, Jarell almost always makes a trip attempt, trying not only to hurt them, but to halt their movement as well. Male orc warrior 3: CR 2; Medium humanoid (orc); Hit Dice 3d8+3; 16 hp; Init +0; Spd 30 ft. (6 squares); AC 15 (+1 Dex, +4 armor), 11 touch, 14 flat-footed; BAB/Grapple +3/+6; Atk +5 ranged (1d8+1/x3, masterwork composite longbow) or +6 melee (1d8+3/x3, battleaxe); Full atk +5 ranged (1d8+1/x3, masterwork composite longbow) or +6 melee (1d8+3/x3, battleaxe); SQ darkvision 60ft, light sensitivity; AL CE; SV Fort +4, Reflex +2, Will -1; Str 17, Dex 11, Con 12, Int 8, Wis 7, Cha 6. Skills and Feats (armor check –2): Climb +5 (2 ranks, +3 Str), Hide +2 (2 ranks, cross-class, +1 Dex), Spot -1 (2 ranks, cross-class, -2 Wis); Point Blank Shot, Precise Shot. Possessions: Arrows (x20), battleaxe, chain shirt, composite longbow (masterwork; +1 Str bonus), traveler’s outfit. Male orc barbarian 2: CR 2; Medium humanoid (orc); Hit Dice 2d12+2; 20 hp; Init +0; Spd 40 ft. (8 squares); AC 15 (+1 Dex, +4 armor), 11 touch, 14 flat-footed; BAB/Grapple +2/+5; Atk +5 melee (1d12+4/x3, greataxe) or +3 ranged (1d6+3, throwing axe); Full atk +5 melee (1d12+4/x3, greataxe) or +3 ranged (1d6+3, throwing axe); SA rage (1/day); SQ darkvision 60ft, fast movement, illiteracy, light sensitivity, uncanny dodge; AL CE; SV Fort +4, Reflex +0, Will -2; Str 17, Dex 11, Con 12, Int 8, Wis 7, Cha 6. Skills and Feats (armor check –2): Climb +7 (4 ranks, +3 Str), Hide +2 (2 ranks, cross-class, +1 Dex), Jump +7 (4 ranks, +3 Str), Listen +1 (3 ranks, -2 Wis), Survival +1 (3 ranks, -2 Wis); Power Attack. Possessions: Chain shirt, greataxe, throwing axe, traveler’s outfit. Male orc barbarian 2: CR 2; Medium humanoid (orc); Hit Dice 2d12+6; 24 hp; Init +0; Spd 40 ft. (8 squares); AC 13 (+1 Dex, +4 armor, -2 rage), 9 touch, 12 flat-footed; BAB/Grapple +2/+7; Atk +7 melee (1d12+7/x3, greataxe) or +3 ranged (1d6+5, throwing axe); Full atk +7 melee (1d12+7/x3, greataxe) or +3 ranged (1d6+5, throwing axe); SA rage (1/day); SQ darkvision 60ft, fast movement, illiteracy, light sensitivity, uncanny dodge; AL CE; SV Fort +4, Reflex +0, Will +0; Str 21, Dex 11, Con 16, Int 8, Wis 7, Cha 6. Skills and Feats (armor check –2): Climb +9 (4 ranks, +5 Str), Hide +2 (2 ranks, cross-class, +1 Dex), Jump +9 (4 ranks, +5 Str), Listen +1 (3 ranks, -2 Wis), Survival +1 (3 ranks, -2 Wis); Power Attack.